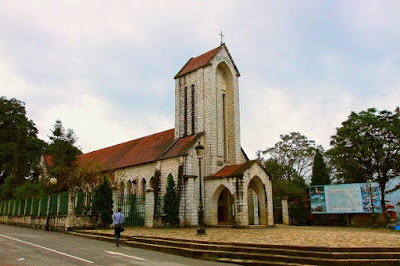 The Church was embellished and preserve as it is indispensable in the Sa Pa town. Currently the buildings, ancient villas in Sa Pa is no longer much. Mark on the architecture of the French left integrity that's stone church of Sa Pa. The Sa Pa Rock Church was built in 1895 and it is known as stone church or the Holy Rosary church. Let explore how beautiful it is with together Vietnam Typical Tours. Before laying the bricks the first foundations for this work, the French architect who had chosen very carefully the terrain to build. The shape and architecture of the church was built by cross. Sa Pa Church set the shape and architecture of the Church was built in a cross by Roman Gotic architecture. The architecture that manifests itself in the roof, the Bell Tower, the arcade ... are the pyramids made for his soaring free definition. The entire chapel was built out of stone masons ' (wall, floor, the Bell Tower, the Church, embankment around) are linked together by a mixture of sand, lime and honey cane. The walls of the wings of the cross on the right was created, textured like stalactites which flows down to augment the natural beauty for the relics. The roof tiles, the ceiling made of straw and lime (refresh now). Especially the ceiling in the steeple (near the Bell) is a mixture of lime, straw, iron, not corrected. Sa Pa Church situated on a prime location with the ham Rong mountain shield, front is flat, land, can develop more cultural works available for social activities. In particular, the Church in the center of the Sa Pa town, standing at four sides can be observed relics, along with two other buildings were also built by the French as the Main Villa (now the Hoang lien hotel) and the District Commissioners (now the headquarters of the Central tourist information) forms a triangle with the architecture separate French-style. With a total area of more than 6,000 m2 Church campus, Sa Pa Church has enough room for the deployment of the covering: The Church, with home made, houses of the priests, the breeders, the angels, the front yard, fence, garden. Made in parallel with the building blocks of the Church, 5: Space close to the Bell Tower is the pastor's rooms, it is close to the Holy Father's room supply, triple nave is the living room. The angels are: a basement, a three-time top floor is home to heal the illness, who travels through the night, to sanitation, food, etc. ; Holy grounds there are two graves, Whispered tree gold on 5 cent, out of which 4 trees grow on rocks. The chapel includes a wider spaces 7 500 m 2, 20 m-high Bell Tower, part of the 1.5 m high Bell Tower, cast in 1932, weighing 500 kg, resonates within near 1 km. Now, on the surface of the Bell also cast recording-definition, the number of people collecting money Bell ...The wooden Bell rack pơmu remains the same after the restoration. Lucid Church orphan between the Central Sapa showcasing many visitors every opportunity to come here. However, through a number of times, restored by the war and the destruction of nature's fierce but the Church retained its charm and spirit of a religious structure. In later years, the war makes almost activities to suspend. After that, the church became the repository of rice. 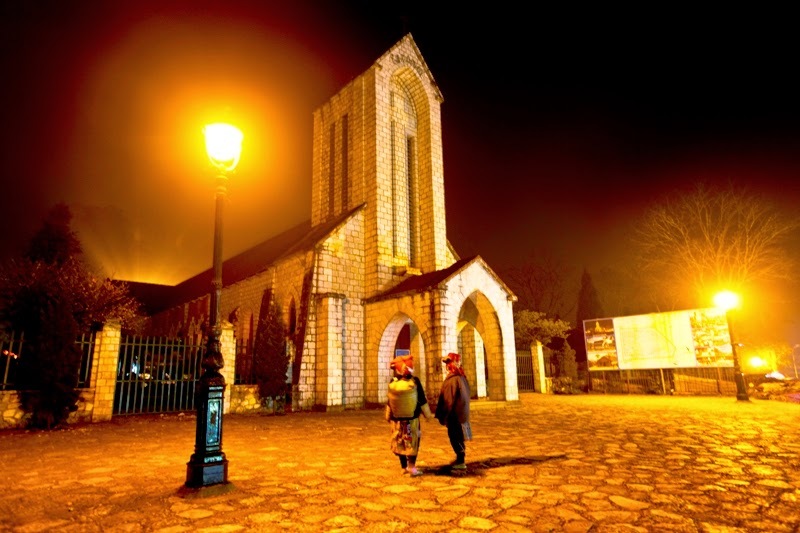 The church of Sapa is always a place where holds many traditional cultural activities of ethnic minorities. 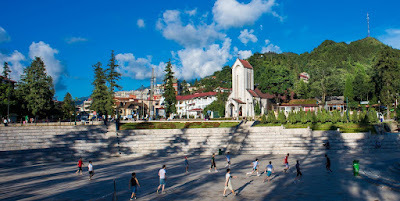 In the front of the church is tennis area which has unique cultural activities of local people on Saturday. With flute, trumpet leaves, “xòe” dance… created sparkling, magical atmosphere in S.
Are you ready for burying yourself into such charming beauty and learn about new culture. 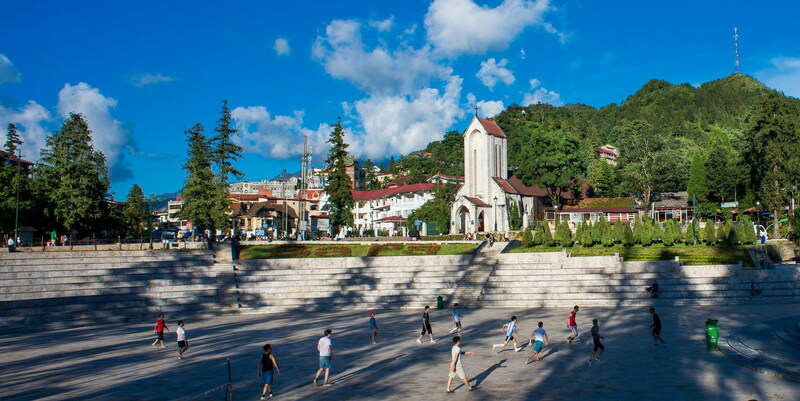 It's time for you to look for a wonderful Sapa Tours to make your dream come true. We hope you have a nice trip!